As we made lunch, I asked him what he'd want every foster family to know. What makes a great foster home? He gave me a 16-point list, which is a telling view of his life in and out of foster homes. Hope explains the success stories of 2018, the plan for 2019, and gives thanks for just a few of the dozens of people who gave (financially and of their energy) to make this year excellent. I have to introduce you to the foster dad I know best. After an unsatisfactory case, Justin and Megan didn’t quit. My family was not very connected [or trauma-informed] and honestly, should have never fostered. Why is it important to recruit foster parents of all races and cultures? If you read our story last week, we hope you felt the weight of asking for a child to be moved from a foster home. Could this situation have been prevented? Is it possible to prevent moving kids from foster home to foster home, and adding to their trauma? We call it bouncing. Or disrupting. Or "putting in notice." These words can make something that would otherwise horrify us seem like part of the expectation. Here's the rub for me: I would never accept that kind of treatment for my son, who was born to me, and I want to people to share that same concern for the kids in Colorado foster care. Against all odds, how can we hold back the fast and furious crisis management of foster care, for more stability? Kids should have one home. These kids already have at least two. Let's not add trauma to trauma. To do better, we need to step back. We need to think, listen, and challenge "the way we do things." Foster parents, along with every other child welfare professional, can set patterns and boundaries to decrease the risk of moving a child. If I could go back in time, I think the following four things would have given the girls the stability they deserve. 1) I would start small. We figured we already had one kid (our toddler son), so what's one more? And if we're fostering anyway, why not siblings? Knowing what I know now, I encourage new foster families to start fostering one child, and accept more children as they are confident in their capacity. Think about the intensity that comes along with each age-range: sleepless newborn, nonverbal toddlers, active preschoolers, school-age kids, teens with more freedom and long-term weight on their decisions. Kids in foster care can have PTSD rates higher than United States military veterans. To love them well, we may need to adjust our sense of normal, and our expectations of day to day life, in order to prepare our homes for their healing process. I know the need is great, and foster homes often take multiple kids to help keep them out of institutions, but I'd rather not send a kid away from my home, and risk traumatizing them more. I'd rather work harder to recruit my friends in caring for children, than put too much strain within one home. If we set our limit at only one child at a time (my family's current standard), the girls may have gone first to a home more adequately prepared for siblings, not needing to move multiple times before going home forever. Disclaimer: You may have a much higher threshold in your family. We've found that fostering one at a time is what we, as young professionals with a young son, can handle. We have several friends with happy houses FULL of kids, and it works for them. But foster parents who foster one at a time are needed, too. 2) I would build my village and prepare support for our family. We naively moved 60 miles from home weeks before bringing these girls to our home. New city, few friends, higher cost of living. Stress upon stress. We didn't have an easy place to send our son when he needed to play with toys without fear of being pushed or bitten. We didn't know what childcare centers might have an opening. We didn't have our network of 20 or so friends in our former neighborhood who would have loved to help us. More stories soon on how to build your village, but this article is a great approach for anyone who wants to help a foster parent. 3) I would have met their parents. I was scared of parents, that first time. I heard intimidating rumors (which would not phase me now) and figured it was best to stay away. I never met them face to face, even though their daughters lived in my home for seven weeks, and visited them twice a week. Frankly, I'm now horrified by the idea that I was acting as mother to someone else's children and never took the opportunity to meet their mom and dad. Regardless of almost any "scary tendencies," I could have requested a safe way to meet and talk with their parents. The older sister told me every day that she missed her mommy, and I wish I'd given her the reassurance that I personally knew how much mommy missed her, too. I remember one day she sent the girls home from a visit with a bag full of gifts and a note that said, "Say thank you to the family who is taking care of you, and be good." She could tell the girls were taken care of. I could have sent a note back, at the very least. Now I know that meeting the parents can help a case in a few ways. First, when kids see a positive relationship between their current caretaker (foster parent) and their primary attachment figure (often mom or dad), they can relax, feeling a little less blind-sided by the sudden change. If mom or dad is positive in response to the foster parent's outreach, the child might see that trust as "permission" from mom or dad to develop and grow in the foster home. Second, when foster parents know the child's parents, they can have a clearer view of the trajectory of the case. I now meet the parents every time, and advocate for services that will help the family. With their focus on one or two families (unlike other professionals on the case with 10+ families), foster parents can speak up for the long term needs and benefit of the family. With teamwork like this, parents of children in foster care often get the help they need more quickly, and they feel supported, not like villains, in their difficult task of stabilizing and preparing to parent again. Third, if the parents do not prove themselves safe and regain custody, the child is more likely to understand, and feel grounded in, their personal history if the foster/adoptive parents showed effort and camaraderie toward the parents. The Annie E Casey Foundation offers a framework for connecting the foster family to the child's family here. If you're unsure whether contact is allowed in your area, I encourage you to ask persistently for a meeting with the child's parents. Use the research linked to advocate for the good outcomes for the child and family. 4) I would make their arrival in our home contingent on treatment. Not because I want to place a clinical qualification over the kids we foster, but because without that pressure, the system is less timely in connecting kids with the services they need. Because I assumed they would fit right in with our family, play with our son, and roll with life, I thought we wouldn't need therapy. I assumed if they needed therapy, we could get them an appointment on the spot. But five weeks in, after we'd asked the county to start looking for a new home, the case manager observed their needs as "more challenging than most" and put the toddler on the waiting list for treatment at the Kempe Center. I wonder, if we would have started therapy on day one, could we have given them stability? We recently accepted a preteen boy into our home, and required that his team get therapy on the calendar before he moved in. Not because we were afraid of him, but because we knew the system needs deadlines and incentives to keep kids from falling through the cracks. He remained with us until his mom was ready for him (to his delight!) to move back home. It wasn't an easy case for anyone, but the teamwork and clear communication kept us empowered to stick with him. Better yet, his therapy continues as a support to his stability at home with mom. My favorite resource for those "How can I prepare for THIS child?" questions is the Facebook group, Parenting with Connection. 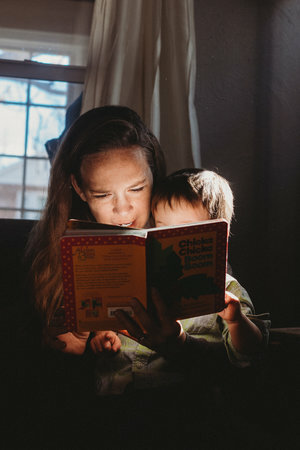 Locally in Colorado, you can get personal feedback from other licensed foster parents at Parents with Altitude (a service of the Colorado State Foster Parent Association). By most standards, I was justified in asking the county to find a new home for the girls. My son was in danger and my family was not able to rise under that level of pressure. But I don't want to defend my decision, focusing on my reasons, rather than their equally real pain. After all, I'm the adult. I would rather spend my words on helping families avoid moving a child. Together, let's hold back the dam of additional trauma for kids in the system. Photos by Hilltop Willow Photography. Thank you Steph and Praj for letting us spend the morning with your family. P.S. If you're in Colorado Springs, join us for a fundraiser and chance to meet local foster parents on March 28. Every time I meet with a Foster Together donor or helper, I leave with a full heart. My whole idea with Foster Together was to show the average person how to meet needs in foster care, and each of our team members bring their specific angle and history into caring for kids and families. I don't want to keep the privilege of knowing them to myself. For Foster Together, our "success stories" are always in the context of relationships. Read their stories, and consider joining us! Nicole is one of our most active Foster Together champions. We've been communicating for months, but only met in person last week at our first Denver "Thank You Party" for donors and helpers. Nicole emailed me a few months back: "I heard you on Colorado Matters on NPR today. I want to know if there's a way to get personally involved." I ran her background check, reviewed some etiquette and expectations with her and a foster mom (who is a single parent, works full time, and fosters a two-year-old) in her zip code, and set them up on a "blind date." They answered the questions I'd prepared for them and decided to move forward as a "foster-helper match." Nicole drops off a homemade dinner once a week, and babysits to allow the foster mom a few hours of quiet time. When she told her story at our party, she said doubling a recipe or taking a walk to the park with her new little friend doesn't take much extra effort, compared to the satisfaction of investing in her neighbors. Brooke, the foster mom who I matched Nicole with, wrote to me. "L (child) loves playing with Nicole and the break for me is so important at a time when financial and emotional resources are thin. And on top of that, she makes us the BEST food!" Sara owns a photography business in Castle Rock. She's proud of her two kids (11 and 9), and she enthusiastically started donating $20 a month at Christmas time. Through emails, I could tell her heart is big, and when I got to hug her in person, I she asked, "What more can I do? I love the way these families provide stability and comfort. Can I babysit? Can I drop off meals?" Kristin grew up as a foster-sister to dozens of kids. Now? She's a second-generation foster mom, supported by her roommates and fiancé. Through weekend trips to Breckenridge, a carefully crafted carpool schedule, and constantly being the youngest caregivers on Parents' Night, they create a stable, extended family for one sixteen year old girl who adores belonging to this unconventional village. (Sidenote: Kristin and her sister, Michelle, started fostering as a team two years ago. Michelle serves as a board member for Foster Together while she completes her MBA at Kellogg.) Kristin received a Panera gift card during our Feast to the Families project, and took her teenager on a special outing. She regularly connects me with new foster families and friends who want to find a way to help kids, but feel overwhelmed by the system. I want you to be part of this team, too. We are regular people creating solutions in foster care (Want examples of what we're doing? See this post). Honestly, I could tell you a cool story about every single person who gives to Foster Together. (A few favorites here and here.) We are foster parents, caring neighbors, business owners, teachers, grandparents. Some of us spend hours every day in contact with kids and families at-risk, and others support that work financially. In six months, we've accomplished plenty, and one of my greatest joys along the way is meeting amazing people who share my concern for kids and families. And we need to grow our team by 100 people investing $10 every month. Every dollar helps us build a clear way to help kids and families (Want examples? see below). I know you care, too. When we meet, or email, or connect on Facebook, you might say, "I really admire what you do..."
But this is not about me doing my project. This is about us refusing to leave kids to fend for themselves in a "broken system." Community for kids. That is the point. And now there's a simple way for you to join us. It's easy. It's not expensive. And we need a bigger team. A few of our founding investors (from $20 a month to a $5,000 gift!) at our first "Thank You Party" in Denver. The heart of this community and plans for 2018 left us all feeling filled up. We could use YOU on our team. We keep our focus clear and our projects efficient, making sure that your donation--$10 or $500--is invested for kids. See what your donation can do here. Email me with questions: connect@fostertogether.co. Huge thanks to Colorado Public Radio for inviting Foster Together to tell our story across the airwaves of Colorado. This segment brought us dozens of new friends, telling us, "I never thought about foster care like this before. How can I help?" They've become advocates in telling the truth about foster care, investing in and volunteering with our families. Scarcity mentality is a weakness of foster care. I often find broken-record phrases like "the system is broken" or “respite is hard to find” to overpower imaginative solutions. The status quo and the overwhelm blinds us to human, neighborly problem-solving. I bribed my foster son to audition for a musical. My husband and I always chuckle when we hear him practicing in the bathroom. Yeah, sure: "troubled preteen, emotionally disturbed." We marvel at the label he's often given.